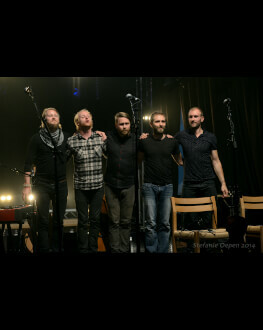 Since Árstíðir’s formation in 2008 the band has released four full-length albums and through relentless touring built a devoted fan base all over Europe, Russia and the United States. Árstíðir got off to a dream start in 2008 with two number one hits on Icelandic National Radio. The eponymous debut album was released in 2009. In 2011 Árstíðir released their second album Svefns og vöku skil. It was recorded at the Icelandic studio Hljóðriti with Ólafur Arnalds as producer, and mastered by German composer/producer Nils Frahm. The following year the band released Tvíeind: an EP containing remixes of their songs by various international electronic artists. Through the years the band has toured over 30 countries. One of the highlights being the celebrated acoustic Falling Home Tour of Europe with Pain of Salvation and Anneke van Giersbergen. A video of the band doing an impromtu a capella performance of the Icelandic hymn “Heyr himna smiður” in a German train station wowed the world after going viral with over 1 million views. Árstíðir is currently working on their third studio album. It is being composed and recorded in Toppstöðinn, a former power plant in Reykjavík. The album is set to be released in September 2014.